I love mystery stories where the investigator is neither a bitter private detective nor a jaded cop, and the setting is somewhere far away from New York, Los Angeles, Paris or other “usual suspect” cities. Larry D. Sweazy’s new novel features a North Dakota farm wife who freelances as a book indexer while also taking care of her disabled husband and their tenuous hold on their windswept acreage. When a nearby farm couple is brutally murdered, the local sheriff comes to see Marjorie Trumaine and asks her to help him track down the meaning or identity of a puzzling clue, a strange, Norse copper amulet found clutched in one victim’s hand. Marjorie is reluctant, at first, to help, creeped out by what has happened to her neighbors and worried about protecting her blind and partially paralyzed husband from danger. Once she does go to work on trying to identify the amulet, however, she begins to come across odd, seemingly disconnected clues. But the puzzles start to become clearer to her once she puts her book indexing skills to work. She begins creating an index of clues and suspects. And what she organizes soon leads her right into an unexpected, deadly trap. Larry D. Sweazy is a well-established Western writer who has been casting a wider fiction net recently. And, like Marjorie Trumaine, he is a professional book indexer. Unlike Marjorie, however, he has compiled more than 800 back-of-the-book indexes for major trade publishers and university presses. Set in the 1960s, See Also Murder is mystery at some of its engrossing best, with an investigator definitely worth following as the new series grows. Though I was born in Mississippi and grew up in Arkansas, I had never thought of Florida as “Deep South.” It was, after all, something of a military backwater during the Civil War (yet a vital place for smuggling in supplies for the Confederacy). During my 1950s youth, when bands played “Dixie” and all-white crowds stood up to raucously cheer, I always pictured the Deep South as ending at the southern borders of Georgia and Alabama. Florida never really entered my thinking as a Confederate state, even though it was among the first to secede. There are, however, plenty of “Southern” echoes in Michael Morris’s fine new novel, Man in the Blue Moon, set in rural Florida during World War I. How the characters talk, think, and interact seem very Southern to me. And the values they hold, as well as the self-righteous justifications they bring to wrongdoings, also seem familiar and right in my recollections of growing up in the South. So I am happy to declare Michael Morris an excellent novelist “in the Southern tradition.” And I hereby amend my mental picture of the literary Deep South to include Florida – especially its panhandle. In Man in the Blue Moon, Ella Wallace’s drug-addicted husband has disappeared and left her deep in debt in tiny Dead Lakes, Florida, with three young sons to support, a small store to run, and a tract of panhandle land “thick with pines and cypress.” Ella’s father had called the tract her “birthright” and, on his deathbed, begged her to hold onto it, no matter what. Now, however, a crooked banker in nearby Apalachicola has come up with a scheme to profit from Ella’s land and is playing every angle – some of them creepy and deadly — to gain possession of the acreage. At the same time, looming large in the background and close around, the infamous 1918 Spanish flu epidemic is taking lives with shocking suddenness. Against this grim backdrop, a mysterious stranger enters Ella’s life in a very unusual way (no spoilers here). And he quickly has two strikes against him. One, he is a distant relative of Ella’s missing husband. And two, he seems to have both a troubled past and some abilities to heal sick and wounded animals and people. These simply heighten the suspicions that Ella and others hold against him. Yet, to save her land, her store and her family, Ella must trust him to help her and her sons try to harvest enough timber in time to pay off the bank note, even as murder, hypocrisy, and other troubles unfurl around them. After reading and relishing Man in the Blue Moon, I am very pleased to add Michael Morris to my personal pantheon of fine Southern novelists. He brings his own echoes to the hall. With Five Dark Riders, his new “fact-based novel,” Sloan demonstrates that he can write engrossing, entertaining historical thrillers, as well. Drawing upon President Franklin D. Roosevelt’s real-life 1936 trip to Dallas, Texas, Sloan has concocted an absorbing tale built around American domestic political intrigue, international espionage and an unfolding assassination plot. In Sloan’s novel, Nazi agents have infiltrated a rural area of Texas where German immigrants first arrived in the 19th century, and pro-German culture and sympathies remain strong as Adolph Hitler continues to gain power. The agents’ goal is to assassinate FDR in Dallas, so Vice President John Nance Garner, an avowed isolationist, will take over the White House and keep the United States from going to war with Germany. The only people who can stop the plot are two South Texans who don’t seem to stand much of a chance: Adam Wagner, a mildly disabled World War I combat veteran who now tends to his father’s sheep and goat farm in South Texas, and Elena Velasco, the beautiful and Anglo-distrusting daughter of an Hispanic family that operates a drugstore in a small Texas town. Adam and Elena decipher the plot while trying to figure out who killed Elena’s cousin, Julio, who Adam had known since Julio was a baby. The local sheriff, an Anglo of German descent, has done little to investigate the young Mexican’s death, and now he has been duped by a close friend who secretly is at the center of the assassination plot. The sheriff has come to believe Adam may be Julio’s killer and may be involved in other crimes, as well. In reality, one of the Nazi agents killed Julio, and Adam and Elena have figured out how and why. No one in authority, however, will listen to, nor believe, Adam and Elena and relay what they have discovered to the Secret Service. So, in desperation and with very few resources, the two South Texans begin a journey to Dallas to try to stop the plot themselves. It’s a dangerous gamble. The Nazis want them dead. And the Secret Service has become aware that there may be some kind of plot against FDR and is trying to maintain very tight security in Texas. Meanwhile, the president’s protectors also are having trouble keeping track of the First Lady, Eleanor Roosevelt, who keeps slipping away from them. And now they have been alerted to the movements of a suspicious, dangerous couple – Adam and Elena – who seem to keep trying to get close to the president, most likely to harm him. It’s an excellent setup for a thrill-ride finish that’s full of history, intrigue, action, and romance. 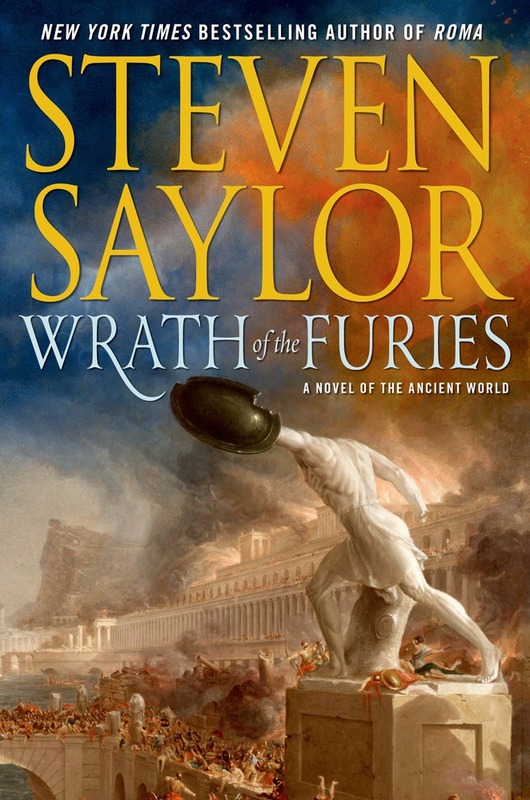 To be honest, until I picked up this book, I had paid zero attention to best-selling author Steven Saylor’s long-running Roma Sub Rosa series of mysteries set in ancient times, in the Roman Empire. The hero in that series’ 10 novels and two short story collections is Gordianus the Finder, Rome’s most sought-after investigator. I’ve never been keen on stories (or movies) where people run around in togas and sandals, swear upon assorted gods and goddesses, and kill each other with swords or poisons. Also, my notion of private detectives has tended to go back only as far as Sherlock Holmes. I’ve mainly been a Spenser/Marlowe/Hammer kind of guy. You know, fists and firearms, not swords and sandals. The Seven Wonders, the new “prequel” to the Roma Sub Rosa series, has, however, just expanded my horizon quite a bit. Saylor has created a mystery- and adventure-packed tale that introduces Gordianus as a young man, before he has assumed the mantle of “The Finder” from his father. The tale is set in 92 B.C., a time when the Roman Empire still dominates Greece. But rumors of war are afoot (literally), spies are everywhere, and even the most seemingly trustworthy friend cannot really be trusted amid all of the anti-Roman political intrigue. It is also the year when Gordianus has reached – and at last crossed – the dividing line between childhood and getting to wear the “manly toga” of an adult. He’s now ready to leave home – Rome – and have some adventures. A real figure in history, Antipater has been given at least some of the credit for coming up with the famous list of the Seven Wonders of the World. The Finder’s son soon determines that the young girl was murdered. Meanwhile, another young girl has been blamed and will die if Gordianus can’t solve his first case fast enough. He succeeds in a clever way, kills his first bad guy, and also has his first sexual encounter, thanks to the sensuous generosity of a beautiful slave woman who has helped him trap the murderer. There are then six more Wonders to see, and at each stop, Saylor provides the reader with mysteries rich in history, legend, danger, plot twists and engrossing entertainment as the youthful Gordianus struggles to puzzle them out. Steven Saylor, who lives in Berkeley, California, and Austin, Texas, is a rare kind of writer, one who deftly blends scholarly detail with fast-paced fiction and makes dead worlds seem to come alive again. I’m now a Spenser/Marlowe/Hammer/Gordianus kind of guy when it comes to detective fiction. And, thanks to this clever prequel, I’m ready to stop ignoring and start reading the Roma Sub Rosa series. The Seven Wonders will be available starting June 5, 2012 and can be pre-ordered on Amazon.com.